We're going to show you how to program a basic synth sound with kick-like qualities. 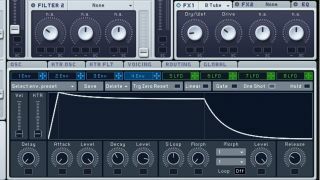 It's always essential that the tuning of your kick drum matches the track, but what do you do when your track changes key? Should the kick move, too, to follow the chordal moves and maintain the 'in tune' relationship? In short, no. Having established itself as the foundation of your track, it's best to leave the kick tuned to one note. However, doubling it with a second, more muted kick containing a pitched element to follow the bass can work well in certain contexts. So, learning how to program a basic synth sound with kick-like qualities that can change pitch as you play up and down the keyboard, might serve you well. Here you can see how it's done in Massive, though countless other synths allow a similar approach. For much more on kick drums, check out Future Music 286, which is on sale now. Step 1: In Massive, we set Oscillator 1 to Sin-Triangle, then use Envelope 1 to shape its pitch. Using a One Shot Envelope, we set a short Attack and rapid Decay, before using Macro 2 as a sidechain source to modulate the pitch envelope. We don't need much level from this macro. Step 2: Only Filter 1 needs to be active. We select LowPass 4 mode, pushing the Resonance to 0. The Cutoff is set at the halfway point but modulated from Macro 3, so that the 'click' at the front of the note is more audible. Step 3: Envelope 4 controls the amplifier. This is set to One Shot mode and the Decay time is crucial. For a pitched, subby note to accompany the kick, set the Decay to around 11 o'clock. If you prefer a purer, shorter kick, back it down to nearer 9 o'clock. Step 4: To give the sound a touch more presence, we use the HardClipper effect on Insert 1, although only a tiny amount of wet signal is required. We add the Brauner Tube as FX1, too, with a little more wet signal and medium Drive. Both effects add more power.